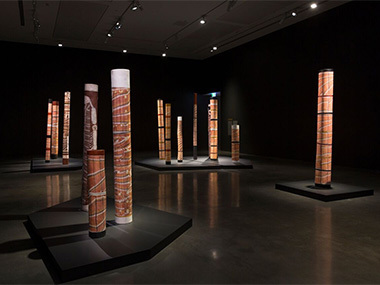 “The crow djang has two navels”, declares the artist in the didactic accompanying one of the 165 barks, sculptures and lorrkons in the marvellous, career-spanning exhibition of the work of Johnny Mawurndjul – aka Balang Nakurulk. It's a mysterious statement that's unexplained and unreflected in the accompanying art – though it's suggested that a fellow-Kuninjku man with the crow name also had two navels, one being removed surgically. Many aspects of the rich and wonderfully divergent Kuninjku culture will remain mysterious even if you spend weeks at the Museum of Contemporary Art show in Sydney, or read every word in the massive 400-page catalogue. But the important thing is that it's here in a southern capital (moving on to Adelaide, then across the country for more than two years) with every effort made to open up those rich mysteries where so many other institutional exhibitions of Indigenous art would rather pretend there's nothing behind the imagery. The irony with Mawurndjul is that he is often painting the most secret/sacred stories of his people in ways that intentionally make them appear to us outsiders as abstract. This apparent absence of story has enhanced his international reputation. But for Kuninjku, they're still readable as aspects of the important Mardayin ceremonies that are the foundation of Kuninjku law and culture. And he is the senior djunkay or ceremonial manager for the Mardayin ceremony, which he's keeping alive through his art. And that solution to his dilemma of revelation came about through his travels and exposure to the art of the world, and his recognition that an artist has to be free to create his own aesthetic even in the restrictive world of Arnhemland tribal systems. Much of this becomes clear thanks to the radical hanging of the show by its curatorium of MCA and SA Gallery professionals, plus Mawurndjul himself. And it's he, I believe, who insisted that, rather than place his output chronologically – as might well have been the norm – ti should be presented geographically. So we tour his significant kunred sites and his sacred djang sites one by one, and get a chronological spread of his development at each. Much more effective than having to run back and forth to the beginning to try to compare artwork number 160 with number 5! Mind you, right at the start in the section called 'Rainbow Serpents at Barrihdjowkkeng', works dated 1985 and 1993 – before Mawurndjul's golden period – one can already see the radical creeping in through the intense rarrking and division of his creatures' bodies into segments – which will progress to abstract in a year or two. Random triangles in yellow, black and brown may reflect the water-lily leaves that float on the backs of Rainbow Serpents – and seem so much better resolved than the bling on the more decorative 2012 'Ngalyod' gaudily placed on the catalogue cover. But then compare the 1983 'Ngalyod' at Kakodbebuldi', coiled with power, eyes glittering with menace and forked tongue reaching greedily off the bark's edge with a 2016 version. Called 'Yingarna and Ngalyod', this apparently random series of rarked patches also contains two sets of vicious teeth, and two pairs of eyes. But they take finding. Even less obvious, in the 'Mardayin at Mukkamukka' section, an all-over abstraction from 2001 just might have a figure looming through the massed rarrk. Two eyes and a head's dome seem to be peering over a dark line. Then, has it become a white oval in 2003? The lengthy 'Mardayin at Dilebang' series of works reveals an intense interleaving of water hole, Ngalyod and the remains of Ancestors traditionally buried there. The power of the place where no non-member of the Duwa moiety should ever go lest “great rains should cause floods”, is readily apparent. And the art, full of bones and skeletal heads, has an obvious language of terror until 2004, when Mawurndjul achieves the same effect in an abstraction involving a generic Mardayin abstraction with the addition of five white elongated shapes – not obviously bones - floating malevolently. Could you imagine that black lines wandering across the sparkling, rarrked waters of his billabongs are the vines that have fascinating powers attributed to them to direct the water-flow? Why is an oddball palm-tree painting to be found in these ceremonial halls? Well, it seems that this Corypha elata or Karlwirri (everything has its Kuninjku name and explanation) not only has its culinary delights but is a constant reminder of the Old People who learnt how to abstract its fruits' benefits. And who'd have thought that the humble quoll would debate the moon about the consequences of death??? For the quoll it was terminal; for the moon, the dead naturally rise again as it does. So, a moon-shaped hole in a rock becomes the obvious place to deposit the bones of the dead just as the moon itself renews itself each month. Delight after delight. Challenge after challenge. Though I have to say that Mawurndjul's take on the numinous is much more effective than his attempts at animal imagery. His inanimate 'Thylacine' (1995) really does seem to reflect its extinction. Not a patch on his Western Arnhem neighbour, the late Lofty Bardayal. 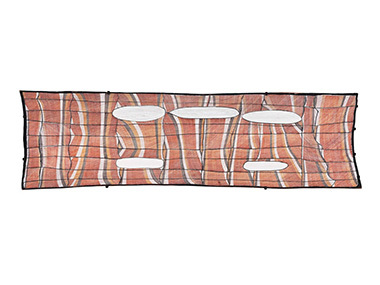 Meanwhile, Mawurndjul's etchings benefit hugely from his mastery of abstraction. Forget the turtle or roo. Somehow he gets the blue glow of the dangarrk lights in waterholes at Mardayin sites - the spirit essence of the ceremony – even in a few black and white lines! Nowhere more so, oddly, than in an etching the leaps off the wall in a concurrent selling exhibition at his regular dealer, Annandale Galleries in Sydney. Perhaps this has something to do with the benefits he received from his 10 year association with Art Director Apolline Kohen – who not only took Johnny to Europe but brought her print-making father, Jean, to Maningrida to work with the artists there. So much good work has gone into this solo show that it seems carping to complain. 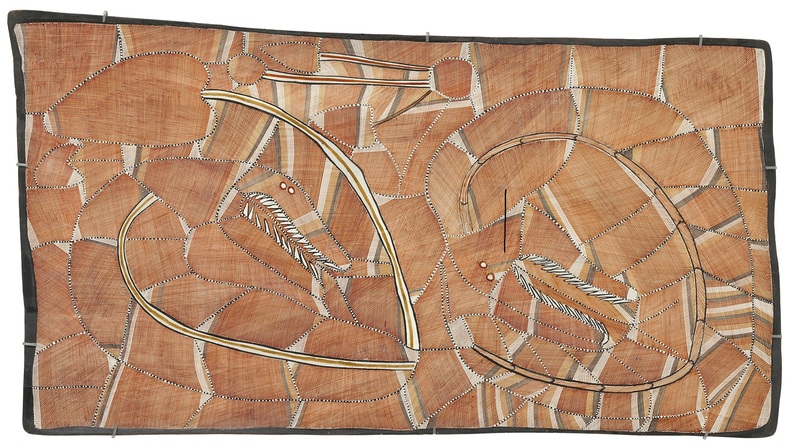 But a room that offers some context to John Mawurndjul's career contains only the paintings of his elder brother and mentor Jimmy Njiminjuma and weavings by his parents. Perhaps a bigger picture could have been achieved with the addition of works by artistic forebears such as Yirawala and Midjawmidjaw, whom he studied, and in particular, by his uncle Peter Marralwanga who really taught Johnny to paint. For I have to say that, having seen a lot of John Mawurndjul's work as it arrived in galleries or in shows such the London 'Rarrk', Tarrawarra's 'Earth and Sky', and the Drill Hall's significant 'Mumeka to Milmilnkan' - the two outstations that have been so essential to his life and work, despite the best efforts of governments to close them down – there was a fear that an accumulation of 100-odd barks would reveal similarities more than variety. Not true at all. How Balang retains a visual memory of his multiple insights into the Mardayin ceremony and sites so that each new work emerges freshly minted is surely proof of his mastery of the bark and lorrkon artforms.